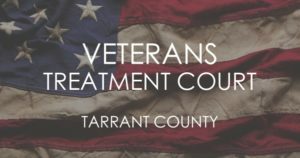 The Tarrant County Veterans Treatment Court is a diversion program for US Military Veterans currently facing prosecution for one or more criminal cases. The program offers accused veterans a treatment option that is closely supervised by the judiciary. The program is designed to divert veterans out of the traditional criminal justice process and into appropriate rehabilitative alternatives. Once the veteran has been screened, assessed, and approved for participation in the program, he or she will begin a treatment program that is specifically designed to address his or her particular needs. Veteran or current member of the United States Armed Forces, including a member of the Reserves, National Guard, or State Guard. All types of discharges are eligible to apply. May have a clinical diagnosis of a brain injury, mental illness, or mental disorder, including post-traumatic stress disorder, that resulted from the veteran’s military service; and affected the veteran’s criminal conduct at issue in the case (no longer a requirement for entry, but still a consideration). Can also be the victim of military sexual trauma (not required). Current case must be pending in Tarrant County. Must agree to report to VCDP case manager as directed. For assistance if applying to the Fort Worth Veterans Court program, contact us today for a free consultation of your case. BHW partner Brandon Barnett currently serves as the designated defense attorney for the Tarrant County Veteran’s Court and is one of the most knowledgeable attorneys in Fort Worth for Veterans criminal justice issues. Mr. Barnett a combat veteran of Operation Iraqi Freedom. We have a heart to help our military veterans, especially those struggling with mental health concerns from combat. Contact us today at (817) 993-9249 or fill out our secure contact form. For more information on the Veterans Treatment Court Program see the Tarrant County Veterans Court website.